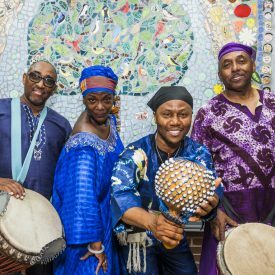 Dunya Performing Arts Company members specialize in laying the groundwork for cultural sensitivity through intense study of the elements of various Diaspora West African drum, dance, song, storytelling, and masquerade traditions from Mali, Guinea, Senegal, The Ivory Coast, and Ghana. Our programs offer an artistic platform for participants to create, imagine, ask questions, think critically, and develop skills that can add value to their communities. 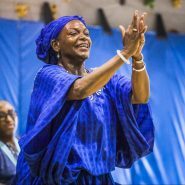 Jeannine Osayande is a teaching artist, choreographer, and performer of West African dance (Mali Empire) for over 35 years. She is founder and director of Dunya Performing Arts Company. Ms. Jeannine apprenticed with De Ama Battle and Bamidele Osumarea of The Art of Black Dance and Music, Boston, MA; Ibrahima Camara, Koumpo/Sahal, of Senegal; and Prof. F. Nii Yartey, Noyam African Dance Institute, Ghana. She holds a Bachelors Degree in Anthropology from Temple University, and a Certificate in Traditional and Contemporary African Dance from Noyam African Dance Institute and the Ghana Board of Education. Ms. Jeannine serves actively on the Boards of the Philadelphia Folklore Project and the Stockton Rush Bartol Foundation. Mama Jeannine teaches technique, repertory, and dance history courses at Ursinus College. She is a member of the Philadelphia Dancing for Justice Chapter. This program was outstanding from beginning to end. Jeannine was unbelievable. Drummers were fantastic. Children & teachers were totally engaged and gave this program 10 stars.